This year's comedy series will feature John Mulaney. On Saturday February 16th 2019, EXCLUSIVELY FOR UB UNDERGRADUATES. This year the SA Comedy Series will be hosted in the Center For the Arts Mainstage. We will be holding 2 separate shows on the night of Saturday, 2/16/2019. You can reserve your ticket from Monday (2/4) @ 10am - Monday (2/11) @ 4:30pm through our online ticket reservation system. You must pick up your ticket at the SBI Ticket office (221 Student Union) between Wednesday (2/6) @ 10am - Monday (2/11) @ 4:30pm. Any unclaimed tickets will be released to waitlisters on Monday (2/11) @ 5pm. Any tickets not picked up by Wednesday (2/13) @ 5pm will be available for any Undergraduate to pickup on Thursday (2/14) or Friday (2/15). You MUST bring your UB ID with you to receive a ticket. You can reserve/pickup 1 ticket per student. You CANNOT pickup tickets for other UB Undergrads. Guest tickets MAY be available for purchase starting Thursday (2/14) if any seats remain. You can verify your ticket reservation by visiting our ticket website where you registered. If you have any questions or problems, please contact our SA Entertainment Coordinator Marc Rosenblitt by email – . 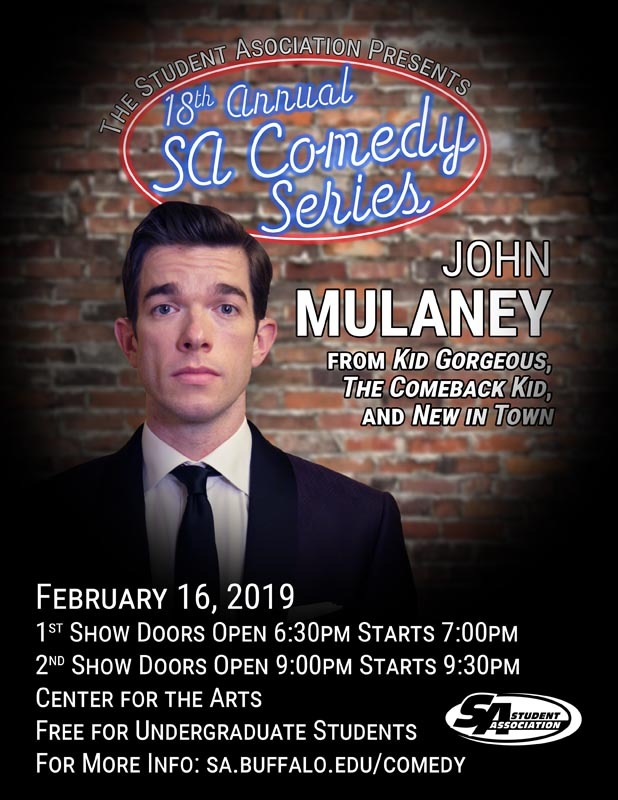 In 2015 Mulaney released his 3rd hour stand up special a Netflix Original titled The Comeback Kid which the AV Club called “his best hour of his career.” He began his career in New York’s East Village and has since toured around the world. In 2008, he began writing at Saturday Night Live where he appeared as a “Weekend Update” correspondent and co-created characters such as “Stefon” with Bill Hader. He currently writes for IFC’s Documentary Now and for Netflix’s Big Mouth on which he voices the character of Andrew. Mulaney’s first comedy album, The Top Part, was released in 2009. He released his second Comedy Central special and album New In Town in 2012, and upon review Ken Tucker of Entertainment Weekly hailed Mulaney as “one of the best stand-up comics alive.